As fulltime RVers most of journey has been met by like minded people in this community, this is not one of those places. The front desk staff is beyond rude - not to mention shady. (This was not a one time occurance, just check out the other reviews.) The park is nothing special so you won’t be missing out anyway, but we stayed here bc it’s close to my in laws. When we arrived for our monthly spot I asked if we needed to give any type of notice when we would be getting ready to take off. The lady at the front told me no. When we decided we would be leaving I gave as much notice as possible so they would have time to fill the spot. It happened to be the day they autodrafted my card for the month. 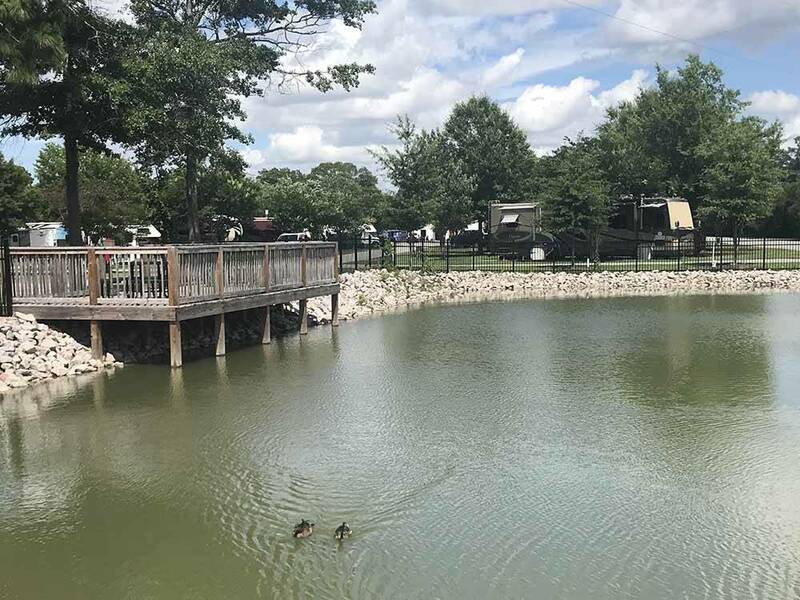 We were going to be leaving half way through the month, so, like any other rv Park we have ever stayed at, I assumed they would prorate the month and refund me the difference. Nope. When I called to give my notice they informed me they don’t refund after your monthly draft. If that was the case, I wouldn’t have put my card on auto draft in the first place - not to mention the fact that she specifically told me I didn’t have to give notice ahead of time - oh and they called me the day I was leaving to see when we would be out of our spot bc they had someone waiting for it, so it’s not like they were missing out on lot fees, just double dipping. This Park does not know customer service and should really invest in a friendlier staff and consider taking care of their visitors. There are other parks in the area that are nicer, I highly recommend checking them out instead. This is a fine place to spend a night or two, the sites aren't real close together and the grounds are well groomed. There are some bumps in the roads but not any worse than the highways. The sites are level, we got a pull through for the one night. Some of the comments were pretty negative so if they think that this place is a little rough they haven't seen what we have in some other places. Overall a great place to spend a couple of nights on your way. If you want cheap, this is it. Also it is convenient off the highway, but I do not recommend it. Its an old park and needs fixing up. The owners should really improve the grounds. You are next to a flea market, and the area is nothing great. Maintenance is lacking... potholes, old trees, need more trees, no grass in many areas, old electric posts and breakers, poor lighting. W-fi was not good either. I guess you get what you pay for. We have stayed here many times. Our Grandboys live close. The staff is very friendly and have. worked with me several times to re-arrange my dates of stay. It is nice and quite, and well kept. 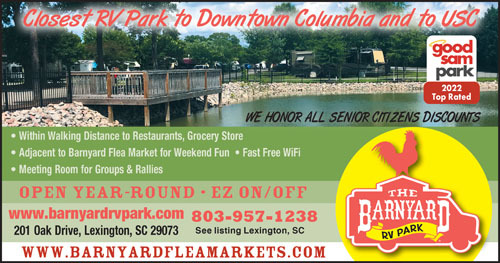 This park on the southwest side of Columbia and is convenient to Interstates 26, 20 and 77 so they seem to get a lot of customers who are passing through. I would sum it up as “average”. The driveways are asphalt with lots of potholes. The site pads are dirt, gravel and grass. The bathrooms are self-contained toilet, shower and sink units. They were generally clean although one of them seemed to have a problem with ants. There is free WiFi but we could not get it from our site, we had to go to the office in order to use it. We had a long and level pull through with a concrete patio, picnic table, cable TV and full hookups with 50 amp electric service. AT&T 4G signal strength is good here at -102dBm. We paid $31 per night with Good Sam discount. We have camped at this facility over the years many times. It is clean, attractive, near a couple of flea markets and not far from the capital of SC. Grandkids enjoy the duck pond. Staff are friendly and helpful. Easy entrance and exist. Club house is small if you are having a RV Group meeting, but will accommodate 20+ members nicely. Reasonable rates. This was my first stay at a Good Sams RV park. Upon arrival of the woman was very courteous, and helpful to show me to my site. After about an hour A gentleman on a lawn mower running around at full throttle making nothing but dust and blowing grass everywhere. Came past my fifth wheel. I have a 2015 Alpine by Keystone and a 2015 Ford F350. Any one who has been around me camping: Can see I take very meticulous care my equipment. I politely asked the gentleman to throttle it Down so it was not blowing so much dirt and grass all over everything. His replie to me this Is how we do it here. ( not having any consideration for anybody's equipment ). At that I approach the office and had ask the woman if she could do something about how the gentleman was running his lawnmower and at that she told me she would see what she could. That night and for three consecutive nights we're many young men and women in the trailer behind me having parties every night. Followed by the next two days of the people they brought in to the campground with their dogs being unruly. I was here for a one weeks stay. I again went to the office and ask them politely if they could move my trailer so I wouldn't have to put up with the noise and the barking dogs. Upon which this was a different woman who answered me in a ignorant tone of voice I have to deal with it! In that she would not move my trailer when there were plenty of sites to move to at that time in the morning. Upon this Conversation not being argumentative I walked back to my trailer put everything away hooked up to my truck and left the campground. Before I left her office I was advised that I would not have my money returned. And apparently I just would have to deal with the problem at the campground. In my three years camping this has been one of the worst experiences at a campground that I've had to deal with. Especially the fact that I cannot get my money back. And I was having to deal with their problem. I hope this information helps the next person considering to go to this campground especially if you care for your equipment and your peace of mind the way I do. A very unhappy new Good Sam's camper. nice flat ,easy pull thru, long sites and nice,clean restrooms. Price was a bit steep for the site/ WiFi only at office and only while office was open. next to no amenities other than a laundry room and horse shoes.social room was always locked. Staff in office was NOT representative of southern hospitality.Staff had a cold attitude about our concerns over several dogs locked in camper next door while owners were gone for the evening The dogs barked for hours. none of the park phone numbers gave us a real person to talk to off hours. we will NEVER stay at Barnyard RV Park again!!!!!!. There are many other friendlier campgrounds that appreciate our business.